One of the most popular annuals, petunias add masses of color to gardens and containers. These tough plants are capable of putting on loads of blooms all season long and come in a wide variety of colors and patterns with an almost endless range of options. The blossom size selection is quite diverse as well. Whether you're looking for a low-growing groundcover, a mounding type for containers, or a rambling wild plant to fill up some space, there is a petunia for every situation. Modern varieties require very little maintenance and aren't too picky in growing conditions as long as they are planted in well-drained soils. 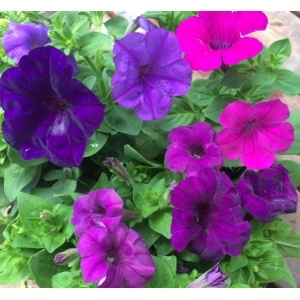 Since petunias are such vigorous bloomers, they do need a substantial amount of nutrients to keep up their blooming power so fertilize them fairly regularly throughout the growing season. Plant petunias in full sun as anything less can lead to fewer blooms and lankier plants. Much like planting in wet soils, less than full sun can make petunias more susceptible to fungal diseases.